Our Personalized Pineapple Mat measures 36"L x 18"H x 1"D and holds up to 15 - 2" characters, in French Bronze or Pewter Silver. Welcome your guests in style, or bring a housewarming gift that will be treasured for a lifetime with our Personalized Aluminum Doormats. They are custom crafted with your own message and are made from 100% rust-free recycled cast aluminum. 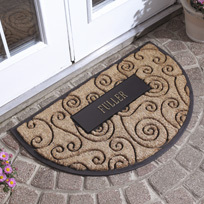 These beautiful Personalized Aluminum Doormats come in two distinctive finishes, French Bronze and Pewter Silver.